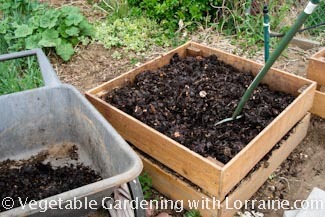 The benefits of compost are so dramatic that no garden should be without a system of regularly incorporating compost. A beautiful and productive vegetable garden is only half of an equation – the half that pulls nutrients and minerals out of the soil for us to eat. 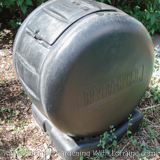 Composting is the other half of the equation, the half that puts nutrients and minerals back into the soil, and keeps the soil microorganisms healthy. 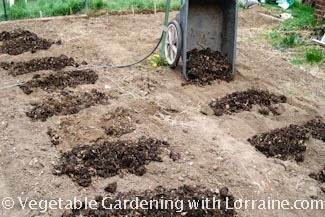 Artificial fertilizers cannot do this (in fact they can damage soil ecology) so you must build a compost pile as part of a successful organic vegetable garden. Without both halves of the equation, a garden will become unbalanced and unhealthy. 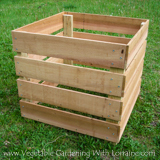 Compost becomes the experienced gardener’s most precious “crop”. 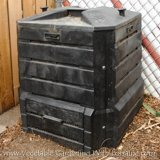 I make a ton of compost, using two of the homemade compost bins shown here. The humus provided by compost is essential for healthy soil structure, which is how soil holds together. How soil clumps may seem irrelevant to us, but it is very important to plants. How the soil aggregates together ("soil structure") is dependent on a healthy soil ecosystem that creates nice loose soils that are good for plant roots. This ecosystem is supported by compost. Compost holds both air and water in soil, dramatically slowing the change from too-wet to too-dry. This creates an optimal environment for the most steady plant growth. This is perhaps the most important of all the benefits of compost. Some of the microbes that live in the soil actually "feed" the plants their nutrients in a symbiotic relationship. Bacteria, fungi, and little dudes called actinomycetes make minerals available to plants, keeping plants healthy and strong. A large percentage of the mass of compost is these beneficial microbes. Properly-made, balanced compost provides a huge range of macro and micro nutrients for plants (like nitrogen, potassium, phosphorus, and many micronutrient minerals), much like a balanced diet does for people. Chemical fertilizers are harsh and kill the symbiotic organisms that help feed plants naturally, in a similar way to how salt kills a snail. The soil organisms are necessary in a natural system to make the food available to the plants. Healthy plants grown in compost-and-mineral-rich soil are healthy, and plants that are healthy are less attractive to plant pests. Bugs are attracted to weakened plants, much like a lion is attracted to a weakened antelope! 6) Nutrition bank account in the soil. The stable carbon compound known as humus, a component of compost, binds positive ion nutrients like calcium and magnesium in the soil, keeping them from washing away. 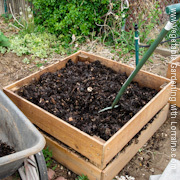 The compost holds the nutrients "in escrow” until the plants need them. When plant roots need those minerals, they are there for them to take. 7) Higher nutrient-density food for us. Healthy plants grown with rich compost and natural minerals not only taste better, they are richer in vitamins and minerals, and with a more diverse nutrient profile. This translates into healthier food for us. An excellent and fun book about this which is full of wonderful color photographs is Teaming with Microbes by Jeff Lowenfels and Wayne Lewis.